GeorgeBestOfficial.co.uk is a website dedicated to football legend George Best offering facts and information and exclusive memorabilia, available to purchase from our store. 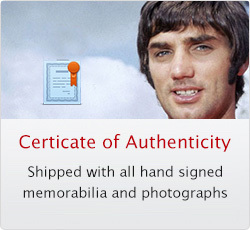 The website contains details and facts regarding George’s career as well as a shop section that gives visitors the opportunity to purchase some very rare and exclusive George Best memorabilia, the site also gives visitors the chance to view highlights from George’s finest moments for his time served at the club Manchester United, including the lifting of theEuropean Cup. All products available to purchase from the George Best online store are in stock and will be delivered to your door within 2-5 days. Payment can be made via our secure checkout system, payment can also be made via cheque(Sterling or Euro), UK postal order, direct transfer. For payment methods excluding online payment, please mail us the item details and we will reserve the item. Any items that contain George’s hand signed autograph come with a lifetime money back authenticity guarantee and have been authenticated by a professional dealer of football memorabilia. We value our visitors and customers more than anything else and welcome opinions and ideas regarding GeorgeBestOfficial.co.uk. If you would like to contact us, please feel free to do so via our email address.